One of the traditional things to do on Chinese New Year is to gather together and wrap dumplings. 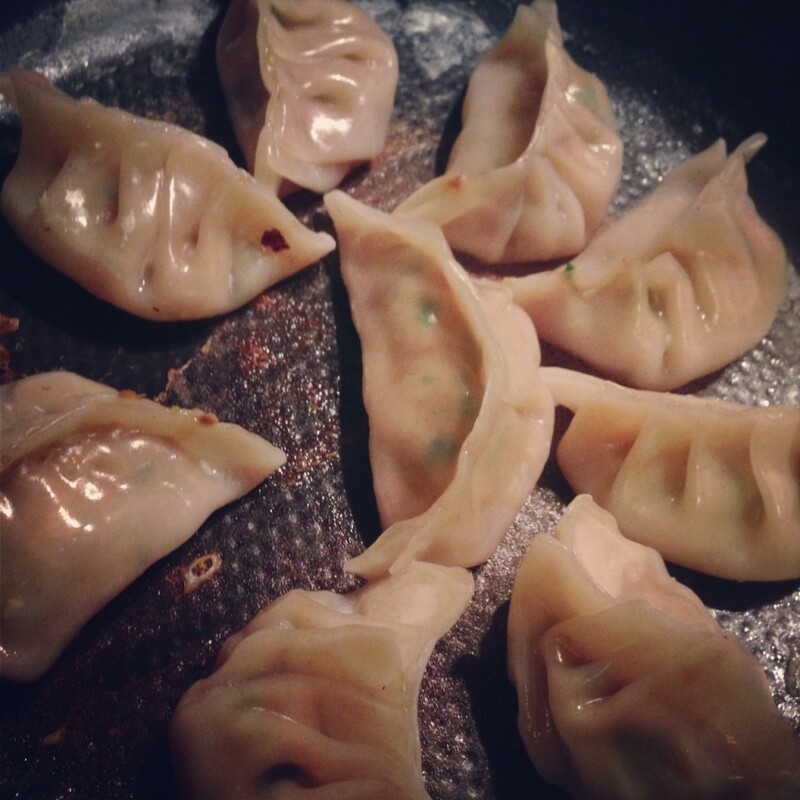 I can see why because you wrap all the morsels faster and get to eat the fresh dumplings quicker, plus everyone gets to enjoy that feeling that they all had a hand in the meal. Fun times. Two types of dumplings were made at my CNY party, and my friend kindly managed the teaching and the wrapping of these on the night while I was manic in my mini kitchen with the other food. I believe her wrap technique was a form of Taiwanese fold, but I’ll be teaching you the Hong Kong folding style. Obvs. 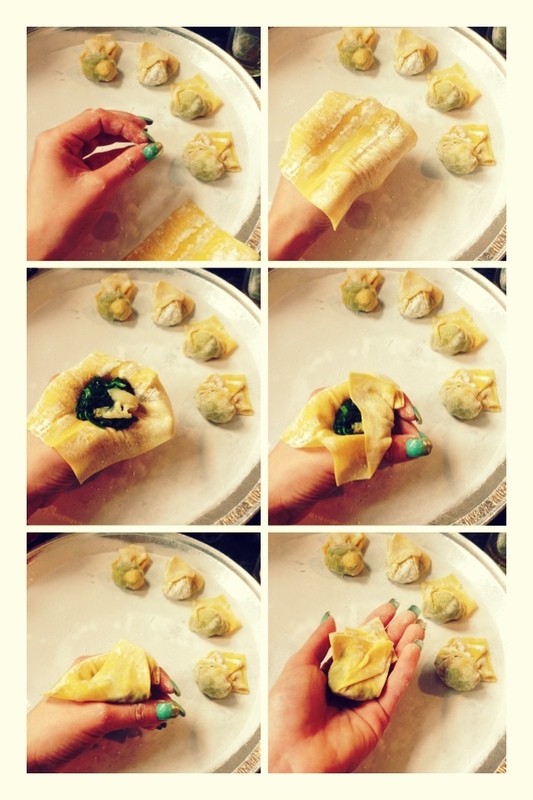 The following filling makes around 28 wontons. Head to your local Chinese supermarket and get your mits on some wonton wraps. Yes. 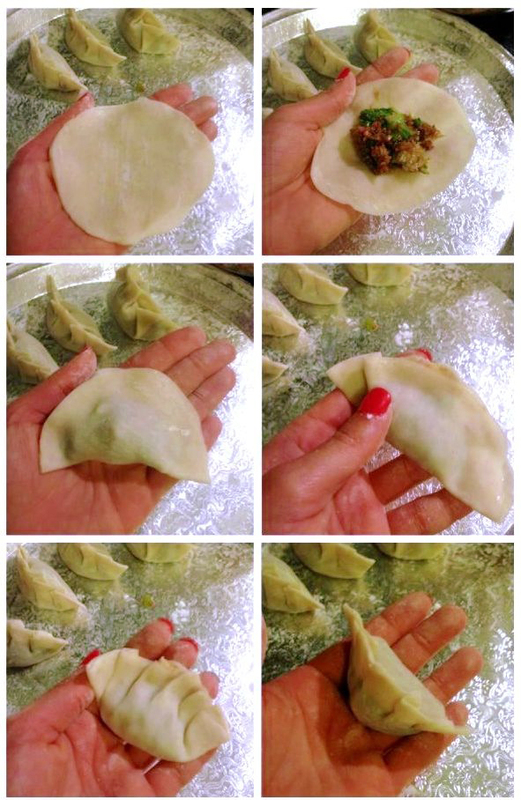 You can try to make these yourself, but one of the joys of nice wontons I find is the loose thin noodlely bits and I can guarantee that you won’t be able to roll the dough thinly enough. Just buy a packet already. There’s no shame in it. Small frying pan on medium heat. Sesame oil in. When at heat, add your crushed garlic and fly until fragrant but not crispy. Set aside. Get a pot of boiling water onto the stove and quickly blanch your spinach. When it’s wilted down strain the leaves and submerge in ice-cold water. Reserve the spinach water for some broth. Keep the leaves submerged while you deal with the prawns. Change the cold water every so often. This helps with getting rid of that metallic taste in your spinach. With a pair of scissors over a mixing bowl cut up your prawns into half-inch bits. Add your pinch of salt then your corn four. Mix mix mix. Strain your spinach leaves and squeeze out all the liquid, you should end up with a couple of tennis ball-shaped spinach balls. With your scissors chop into these roughly and add the cut up bits of veg directly over your prawns. Finally add to this the garlic and sesame oil and the rest of the seasonings. You don’t want this mix too wet so easy on the soy, compensate with a bit more salt if you fancy. Mix thoroughly. You’re now ready to wrap. The key to nice wontons is a lightness of touch and some finger dexterity, so hopefully these steps and my little photo How To will help. The only things I will emphasise is that these wraps are delicate and you don’t want to overfill them. You’ll need some flour dusted trays to stop the wontons from sticking and a small bowl of water to seal them. 5. Carefully pleat the corners over and lightly seal just around the top of the mix with length of your forefinger from your other hand. 6. Done! Try to avoid bunching/clumping the top frilly bits. You’ll want these lovely and loose in your broth. When you want to cook these, get a pot of water to boil. 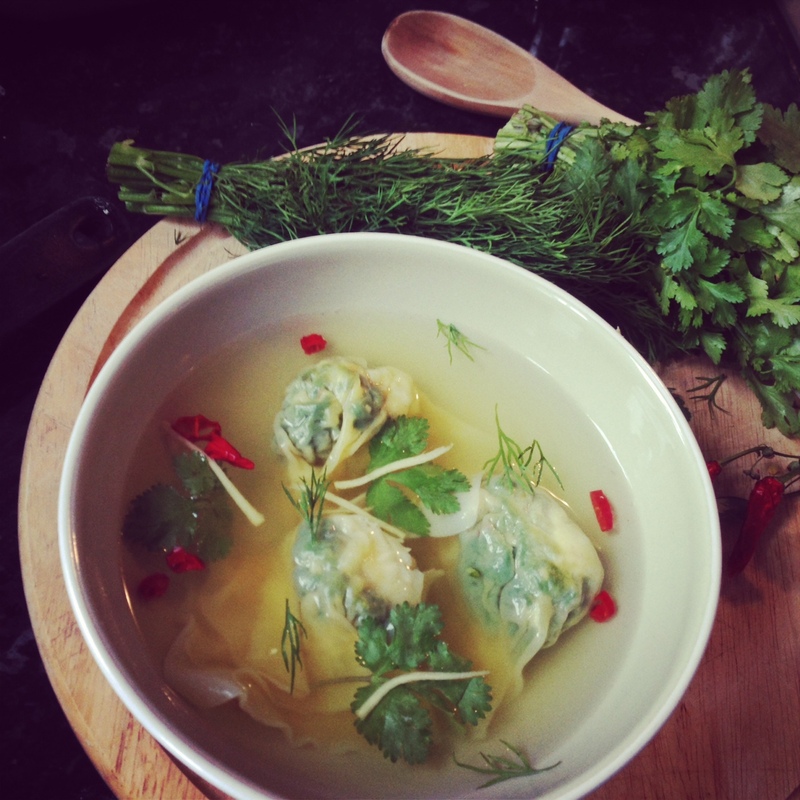 When boiling use a slotted spoon to agitate the water and carefully drop the wontons in. Keep carefully agitating, this stops them from sticking to the bottom of the pot. When the water comes back to the boil and the wontons float to the surface you’re ready to dish them up. I served mine with a broth made with some reserved spinach water, with splashes of soy and fish sauce. Add to this some fresh dill, coriander, chilli and thinly sliced ginger. Oh! If you want to save these they won’t keep in the fridge so you’ll have to freeze them, set them apart on a tray and place them in the freezer, once solid collect them all and pop them into a freezer bag. Cook them in boiling water from frozen later. My kinda fast food. My first dim sum post! How exciting. 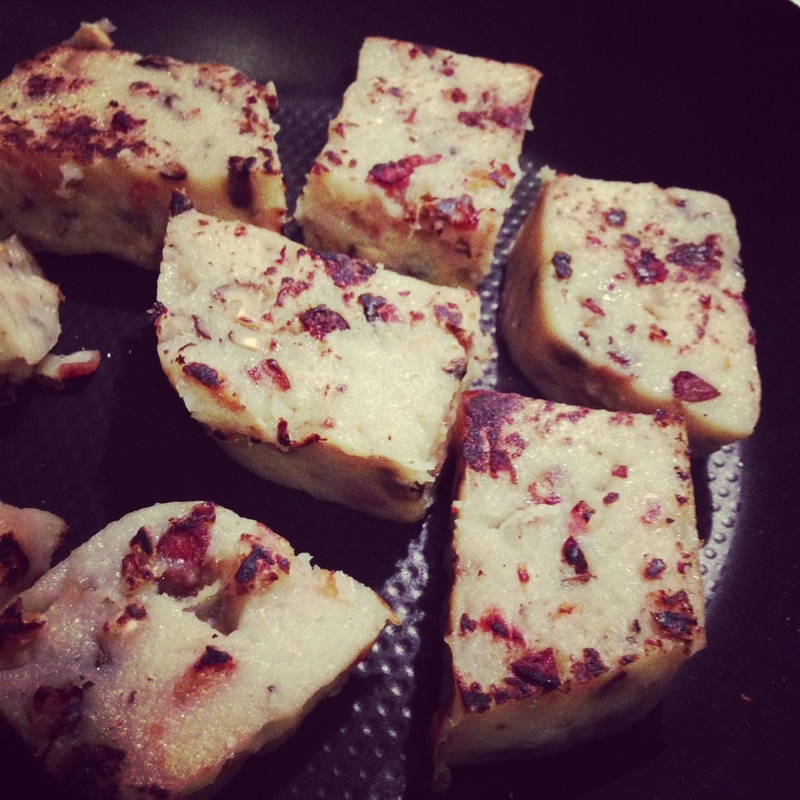 So as promised, I’ll be blogging Chinese New Year celebratory dishes and here’s the humble radish cake – a symbol of prosperity and the dim sum staple. A dish that can so easily flit from greasy and bland to chewy unctuous yumminess. It’s surprising how common this dim sum dish is as it’s tricky to master, but having failed making this dish so…so many times…This year, I’ve finally got it right. In attempts of the past I’ve always got several things wrong, but mostly it was the balance of radish to water and flour. So if you find me getting a bit pedantic in these areas you’ll know why. There is no saving a radish cake that has the texture of a rubber door stop. 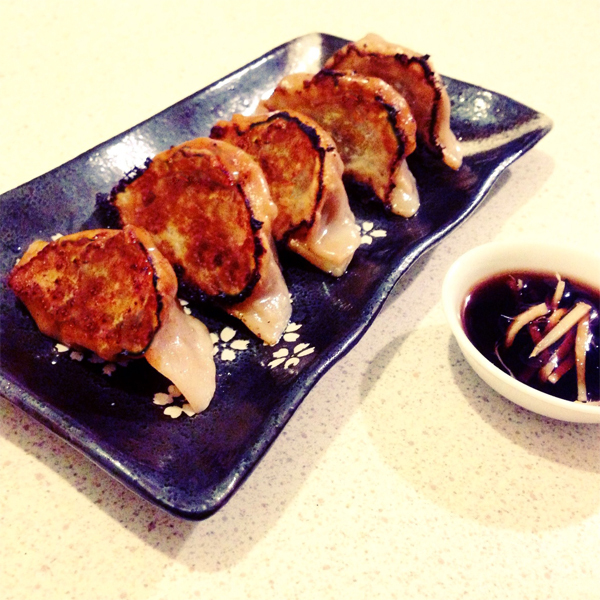 For those of you who’ve never had radish cake, it’s not really a cake in the traditional sense. It’s not a fluffy dessert, but a savoury appetiser of sorts that’s got a lot of preserved and cured meat in it, so if you want to make a veggie version I would suggest sticking with a mix of shiitake mushrooms and maybe some Buddhist veggie meat found in your local Chinese supermarket. This takes absolutely ages to make, so set aside a good few hours at least. I made mine the night before New Year’s day. *I used 3 types of cured meat. This worked out at a bit of Chinese bacon (臘肉) a small cured sausage (臘腸) and small duck liver sausage (膶腸). In a bowl soak your mushrooms in 2 cups cold water to soften them up. In another bowl soak your dried shrimp in 1 cup cold water. I like to stack the shrimp bowl onto of the mushroom bowl so the mushrooms get fully covered in water and thus soften up quicker. You should have about a 1 1/2 inch piece of Chinese bacon, cut your sausages up into similar sizes. Place all this cured meat into a shallow dish and steam the meat for 30 minutes to soften it up. While that is steaming, peel all of your daikon. Then on a large chopping that can retain liquid grate all of that radish! Damn. This is super tiring! 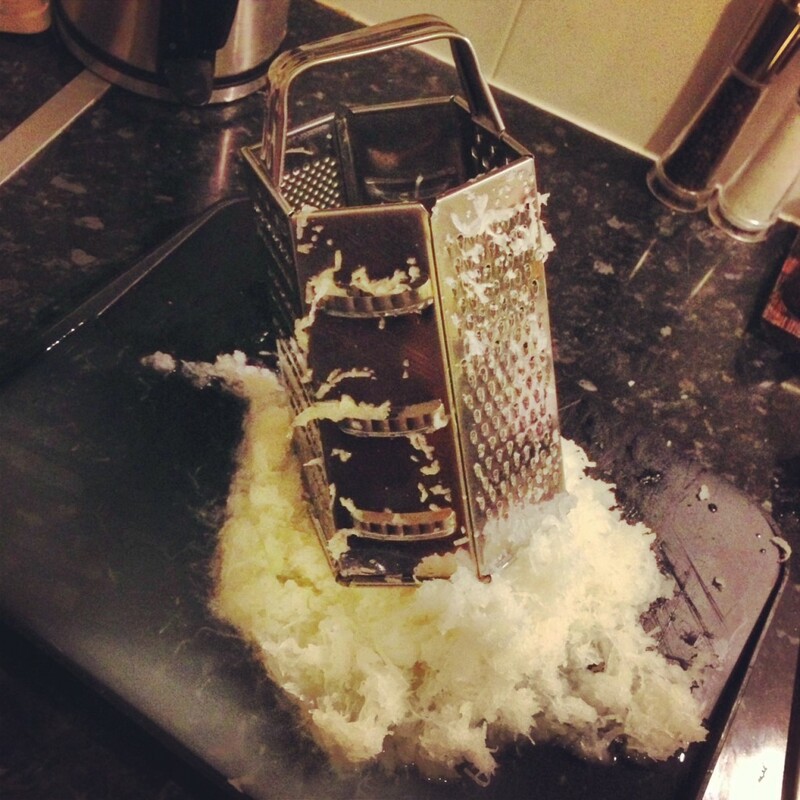 It took me half an hour to peel a grate this lot. I’m not sure what that says about me (weak. I’m blatantly weak. Not enough Asian stamina), but I just kept thinking of my little Chinese grandmother and the thought that she’s been making this dish six times (on top of another 6 taro cakes as well) for all her children’s families every Chinese New Year…it’s just…unbelievable. Anyway. Grate like a mad person. When done place all of the grated radish and it’s liquid into a pot and combine it with a litre of cold water. Bring this all to a boil then turn the heat down and simmer for a further 30 minutes until tender. Once this is done you want to drain the radish but reserve the cooking liquid. While the radish is cooking you want to deal with the now steamed dish of cured meat. Remove and discard the rind of fat from the bacon and dice your cured meat into little cubes around 0.5 – 1 cm. Reserve the oily liquid in the shallow dish. Set the diced meat aside. With the soaked mushrooms and shrimp you’ll want to save their soaking liquids in their separate bowls. So when your mushrooms are soft enough squeeze out the water from each mushroom, set the soaking liquid aside, discard the stems from the mushrooms and dice them in a similar manner to the cured meat. Drain the shrimp and set their soaking liquid aside. Basically you should have four main components with separate flavoured liquids to accompany them: radish and radish stock; cured meat and steamed juices; diced mushrooms and soaking liquid; shrimp and soaking liquid. Get a large pot or wok on the stove. Fry up your meat for a few minutes until they start to brown and release fat. Now add your diced mushrooms and shrimp. When fragrant add the meat juices from the steaming dish, the rice wine, sugar and salt. Remove from heat. To this large pot, now add your drained radish, combine well and set aside. In a large bowl add your rice flour. Now to this add 1 cup of hot turnip stock, 1/2 a cup of the mushroom liquid (carefully avoid the debris at the bottom of the bowl), 1/2 of the strimp liquid (same again, avoid the debris). Whisk up the flour and liquid and pour into the turnip, meat and mushroom pot. Stir throughly it should resemble rice pudding and do a quick taste test (yes it’ll be a bit floury but you want to have enough salt). Whack all of this mixture into a large enough cooking dish. Traditionally we use metal trays but mine with perfectly into a 8 inch diameter pie dish that was 3 inches deep. Nice. At this point you’ll want to set a large wok up for steaming. Place a trivet at the bottom of the wok and add enough hot water in before it reaches the top of the trivet. Lid on. Boil that liquid to produce steam. 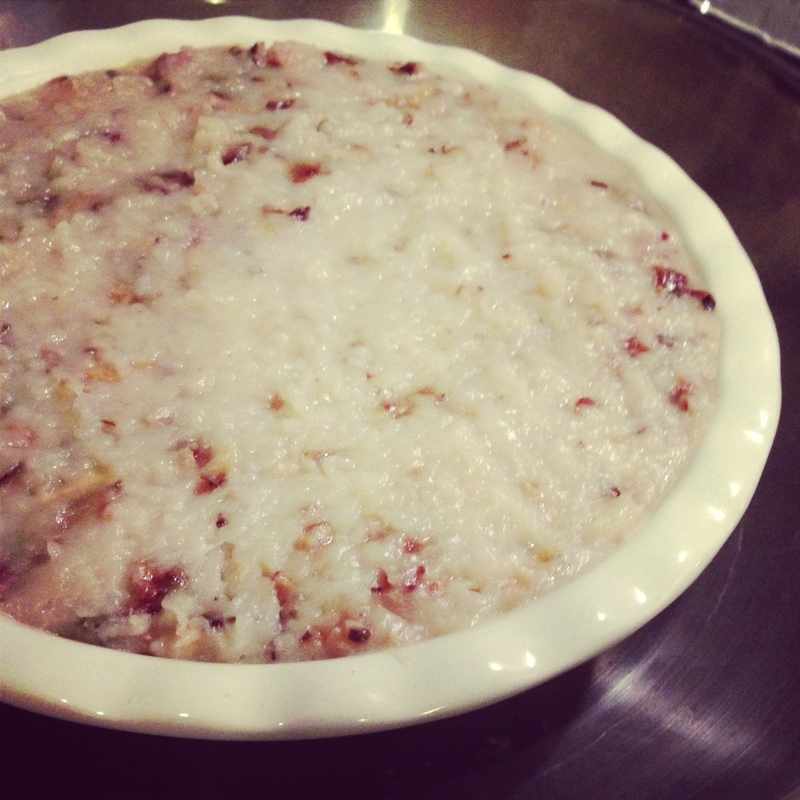 Add your dish of radish rice pudding to the centre of the wok without letting the dish touch the sides of the wok. Lid on again and steam for 1 hour, or until the ‘cake’ is firm to the touch. Poke it with a skewer to check that it’s all cooked. Keep an eye on the water and top it up if necessary so there’s always steam. This is what mine looked like when it was done. I was hopping around with joy at 1 am because I knew it was right. Cover and refrigerate for at least 3-4 hours before you serve. When you’re ready to serve this, you’ll need to carefully cut it into pieces that are approximately half and inch thick. Frying pan on. Heat medium high. Add a bit of vegetable oil (corn or rapeseed good) and fry your radish cake so you get nice crispy cakes. Dish up. Bit of chilli sauce and maybe some soy and you’re good to go.